Death note was an amazing manga, it was an amazing anime as well, as a matter of fact it had some amazing movies too, five of them. 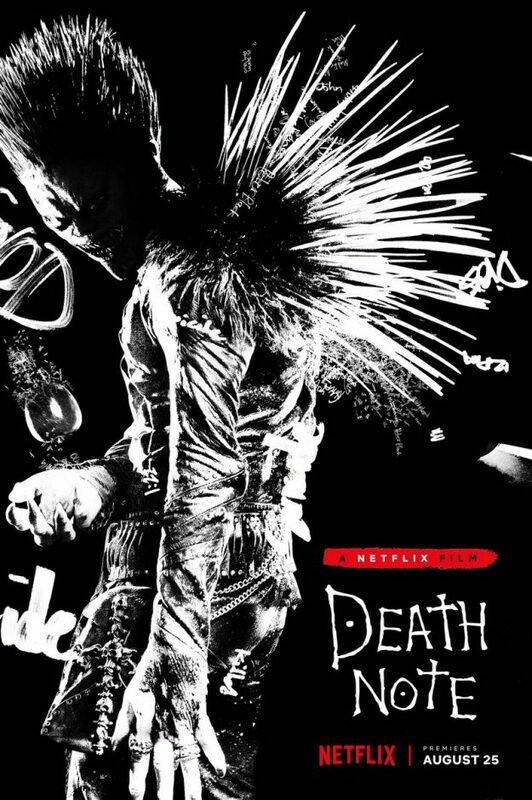 So it is hard to argue that the netflix adaption needs to be 1 to 1, seeing as it would be the sixth death note movie, if these were sequels, it would be at death note in space territory. For the new people, the basic story is that a genius high school kid named Light finds a book, the book can kill anyone who's name is written in it, Light decides that all bad guys need to die, with the help of a death god named ryuk egging him on, he starts killing people. A genius detective named L takes notice, and proceeds to try to track down and trap Light to lock him away for his crimes. Intrigue, schemes, ploys, and chess master level strategies ensue, with a heavy dose of awesome. Now netflix has it set to come out august 25th, and the trailers have caused a lot of backlash, Light Yagami is now Light Turner a white guy who seems like an outside, Japan is now Seattle, L is black. The tone seems a little more action oriented, more bodies, explosions, and destruction is featured in the trailer. It feels like a lot of people are just reacting to change in general. The fact is this, I don't want a sixth perfect remake, I have seen the previous 5, they did awesome capturing it. I have always felt that despite being great, death note was a little heavy on the intrigue and a little light on the action, I have also felt that death in it didn't really register as more than a stake that happened to people, and finally I had always wished that it had a little more action in between the 15 minutes of verbal jousting. The netflix adaption seems to have addressed all of these things, and bonus, its more relatable to the demographic watching it. Usually I would be up in arms with you, usually, but again, it has been done properly and well a few times over. Worst case it will completely miss the point and you will have 5 other movies about the exact same thing to watch. Best case it will add more dimension and new takes to a story we all completely love. Adam Wingard (You're next, The Guest) has made some really nice scenes and a good dose of atmosphere in the trailer, Roy Lee stated the obvious as well, it is specifically a western adaptation for a different culture, so changes needed to happen, and objectively, nothing I have seen has made me mad at it, Light still feels like light, L still feels like L.
Quite frankly, and this is going to be my closing argument, the entire cast could actually be swapped out with rat terriers, it could be Death Note: Wish Bone edition, and I would still watch it just to see Willem Dafoe play Rayuk, seeing that is worth the entire rest of the movie being wrong.